Introduction: In view of the detailed histologic evaluation of prostate cancer (PC), it is usually advisable to provide a “second opinion” to confirm diagnosis. This study aimed to compare the Gleason score (GS) of initial diagnosis versus that of histopathologic review of patients with PC. The secondary objective was to compare initial GS versus histopathologic review versus post – surgical histopathology. 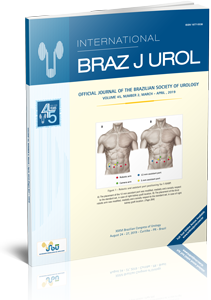 Material and methods: Retrospective study based on chart review of patients with PC that attended the Uro – oncology Department of Hospital das Clínicas – UNICAMP – Campinas, Brazil, from April, 2002, to April, 2012. Data were divided in groups: patients with biopsies performed elsewhere, biopsies after pathological review and histopathological results following retropubic radical prostatectomy (RRP). These were evaluated in relation to GS difference using Fleis’s Kappa concordance coefficient. Results: 402 PC patients, with a median age of 66 years, were evaluated. Reviewed GS showed worsening, with accuracy of 61.2%, and Kappa concordance value = 0.466. Among 143 patients submitted to surgery, GS varied widely, regarding initial evaluation, review and post – surgical RRP. Joint concordance of evaluations was weak (Kappa = 0.216), mainly due to almost no existence concordance between initial evaluation and following RRP (Kappa = 0.041). Conclusion: There is a great histopathological variation of initial GS versus reviewed GS. There is also a better correlation of reviewed GS and post – surgical GS than with initial GS. 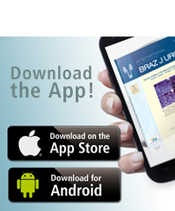 The second opinion by an uropathologist improves diagnosis and should be advised for better therapeutic decision.